The transition from fall into winter can be brutal in the bee yard. It’s the time of year when the drones (the larger, sort of bumbling, non-stinging male bees) are literally dragged out of the hive. The female worker bees preform this task as a way to bring the hive’s population down. Fewer bees in the winter cluster means fewer bellies to feed. And not taking risks with the food supply is a sure way to increase a colony’s odds of making it through the long Wisconsin winter. I hate to say it, but really, the drones wouldn’t stand a chance with any plea they might make to stay. They just don’t have a whole lot in their favor. Drones don’t forage. They don’t participate in making honey. 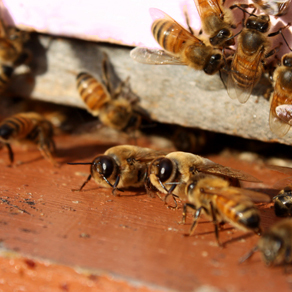 They don’t work as nurse bees – tending larvae, or as guard bees – protecting the colony. They don’t do any comb construction. To make matters worse, they defecate in the hive, leaving the females to clean up after them (the ladies are fastidious and exit the hive to do their business). And to top it off, drone larvae is the preferred breeding ground for the deadly varroa mite. When it comes right down to it, a drone’s only “job” is to circle high in the air some distance from the hive, waiting for rogue, unmated queens to come by. A queen only makes one mating flight in her life, so I have to think it is pretty lonely work for the average drone. What’s worse, should they actually get the chance to put the moves on a queen and pass on their lineage, that’s it – death is soon to follow. This doesn’t seem to get them down. Nor does getting chucked out of the hive to meet their end with the winter chill. Maybe it’s because I can think of no worse way to go than freezing to death, but I tend to have a lot of sympathy for the drones. I cringe to witness this annual ritual. I snapped this photo on Friday – just before the snow set in. Two drones standing side by side (their larger eyes and slightly burlier builds set them apart). At the risk of sounding anthropomorphic, I like to think they are enjoying one last fall afternoon on the front porch – remembering a summer well spent. One last hurrah.